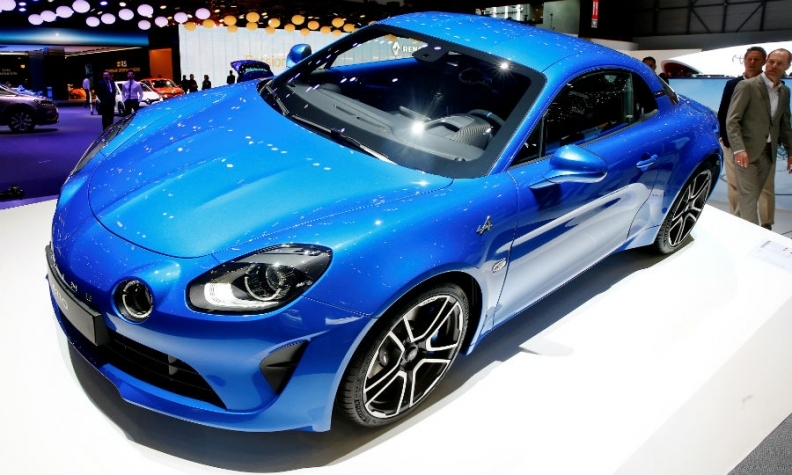 The Alpine A110 is helping to boost Renault sales. PARIS -- French passenger-car registrations rose 9 percent in April, led by strong gains at Dacia, Hyundai, Kia, Fiat and DS. There were 187,396 registrations in the month, which had 20 selling days compared with 19 in April 2017, industry group CCFA said. Adjusted for that figure, growth was 3.6 percent. Sales have increased 4.4 percent in the first four months. In a note to investors, ISI Evercore forecasts that sales will increase 3.3 percent this year, and said that gains in France, the EU’s third-largest market, are expected to ensure that Europe as a whole shows positive growth for the year, despite slumps in the UK and slower growth in markets such as Germany and Italy. PSA Group recorded a gain of 20 percent, although that includes Opel sales, which were not included in 2017 figures. The Peugeot brand was the No. 1 seller in France, gaining 12 percent for the month behind strong sales of the 2008, 3008 and 5008 crossovers. Citroen sales fell 4.9 percent. The upscale brand DS benefited from the introduction of the DS 7 Crossback SUV, with sales rising 69 percent to 2,630 for the month. Budget brand Dacia led Renault Group, which gained 11 percent for the month, with an increase of 31 percent driven by the newly refreshed Duster SUV. Renault brand gained 4 percent, and the reborn Alpine sports-car brand has started to have an impact on sales figures, with 114 registrations in April, and 145 for the year. Hyundai Group led Asian and overseas automakers, with Hyundai brand sales up 43 percent and Kia up 23 percent. Toyota sales were up 26 percent, and Nissan sales fell 22 percent. Fiat-Chrysler group sales rose 27 percent, with Jeep up 36 percent and Fiat up 29 percent. Alfa Romeo sales increased 6.8 percent. Ford sales were up 8.1 percent. Volkswagen Group sales were up 5.8 percent, led by Skoda at 22 percent and Volkswagen at 11 percent. Seat sales flattened to 0.3 percent, while Audi sales fell 7.1 percent. Among German premium brands, growth was flat at BMW Group at 0.3 percent, with BMW brand’s 4.8 percent increase offset by a decline of 6.8 percent at Mini. Daimler Group increased sales by 2.3 percent, including 1.7 percent at Mercedes and 8.7 percent at Smart. The penetration of diesel engines was 40 percent, the same as in March, but down more than seven percentage points year over year. Light-commercial vehicle sales rose 6.9 percent in April, or 1.6 percent on an adjusted basis.